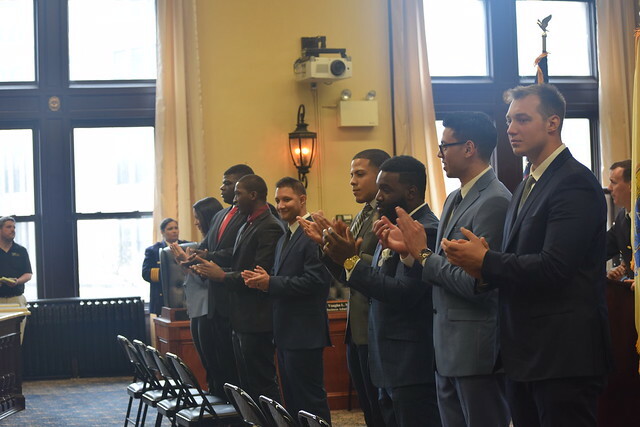 Mayor Andre Sayegh swore in eight new police officers on Monday morning, first class since the sentencing of two of six police officers ensnared in a federal corruption investigation. Sayegh nicknamed the class of seven men and one woman the “great eight” for making it through an intense screening process. Municipal officials had 19 openings for which 75 candidates were certified — only 8 were picked. Oswald mentioned empathy, work ethics, and morals. Speziale said police legitimacy is established through fair treatment. Speaker after speaker urged the new recruits to serve with integrity and never to go astray. Six police officers were arrested in an FBI investigation for violating people’s civil rights. Two have been sentenced to federal prison. Police were also the target of repeated protests following the death of Jameek Lowery. Business administrator Vaughn McKoy warned the officers of three enemies. He mentioned complacency, entitlement, and arrogance. You are not entitled to anything just because you wear a badge, said McKoy. 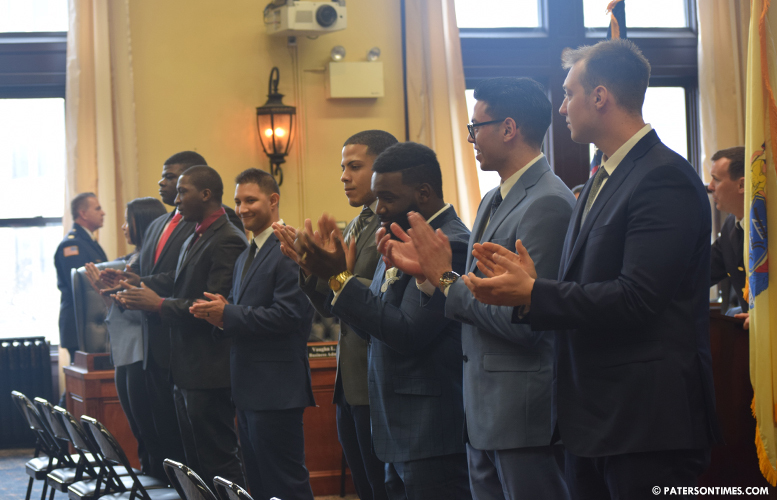 The eight recruits will spend the next six months in the Passaic County Police Academy starting next Monday, said the chief. He said the officers will be deployed in September. With the new recruits, police will have 404 officers, down from 418 due to retirements and loss of officers due to the federal investigation. “Now more than ever, we’re all being tested. So that we could be trusted. All of us need to be trusted. So that those we protect and serve know that their faith in all of us will be restored,” said Sayegh, who is also trying to re-build trust after the conviction of his predecessor, Jose “Joey” Torres. Just wondering how long before these scumbags start robbing motorist and selling drugs.